These 5 tips will help you ensure that your remote employees are productive and stay on target with their goals and work. Having remote employees can be difficult to manage, but by implementing these tips and using the technology you’ll be able to make the most of it! The freelance and remote economy began in earnest during the Great Recession, when millions of people lost their jobs. Often, people who were unemployed were able to cobble together part-time work with remote work or freelance work. 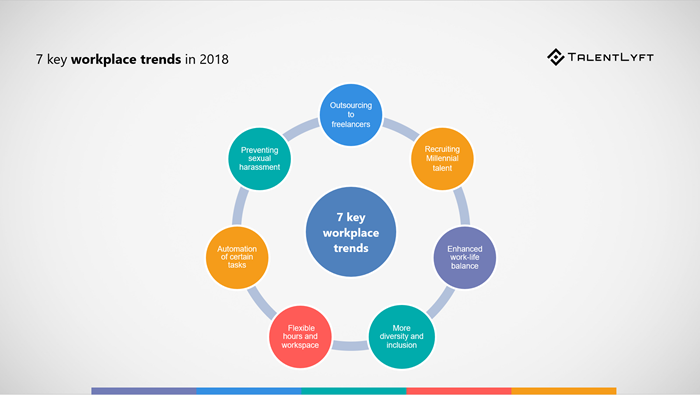 From then on the popularity of remote work continued to grow, becoming one of the key workplace trends in 2018. One of the most important benefits of offering remote work is its appeal for talent. Both millennials and seniors enjoy flextime jobs because they enjoy the flexibility that it allows them to take care of families or work other jobs. This is why companies who offer remote working options are seen as more attractive by potential job candidates. Thus, offering remote work opportunities is one of the best recruitment strategies to attract talent. Download The Ultimate Guide for Finding Qualified Candidates in 2019! In addition, because technology has become more advanced, companies are finding they can save money by hiring part-time or remote staff. Companies are also saving money on office space because there are fewer employees at the office each day. While there are many upsides to hiring remote workers, there are also some challenges. Some companies began with remote employees in order to maximize profits, but found that their remote employees spent more time playing X-box than they did working. While some companies have not been successful, that doesn’t mean your remote employees won’t be. There are proven strategies which can ensure that your remote employees are happy and engaged. With the right recipe and the help from technology, you can make sure that your remote employees stay on target and help your company move forward. 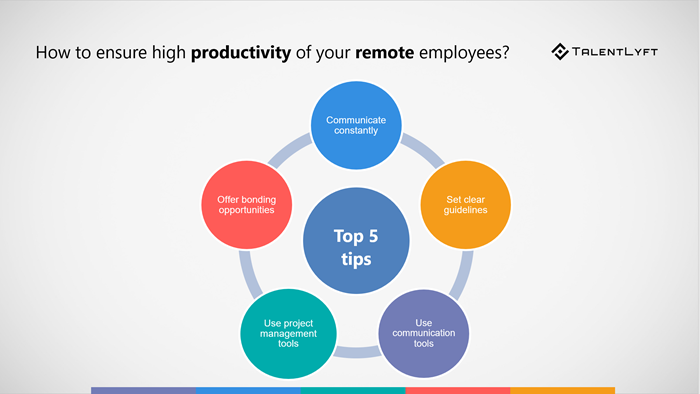 How to ensure high productivity of your remote employees? Businesses who have remote employees have stated that constant communication is the key to a successful flextime mode. Because many companies hire employees that are located in different areas of the country and around the world, you will need to have a strong communication system that enables constant communication. In addition, you need to establish some guidelines as well for both efficient and effective communication. To ensure constant communication, you need to make sure that you have rules in place for how and when employees communicate with the company. Ask for input from your employees about when they think communication should take place. Establish guidelines and expectation for communication before you even begin to have remote employees. This helps to ensure that everyone is on the same page before work begins. It will also help you keep your data secure while working with a remote team. One way you can make sure that your employees are able to communicate with you as well as each other, you can have a cloud-based phone system. Cloud-based phone systems allow employees to be in on conference calls, which means that you can establish regular meeting times with a group of your employees or all of them in order to make sure that everyone is on the same page, which is not easy to do if you have to wait on phone problems or dropped calls. You can use tech tools to have your employees communicate in other ways besides the phone. There are social media platforms and messaging apps that allow employees to chat with each other one or one, or as a whole group. Some applications allow for chats to be stored as files so that employees can keep track of who said what and when they said it. By using tech tools, and establishing a protocol, you can ensure that your remote employees communicate constantly and stay on the same page. Many employers find it difficult to have remote employees at the beginning, especially if they are used to being able to watch their employees at work. However, if you are able to find the ability to let go of a little bit of control, you may find that allowing employees to work remotely makes them more productive. Not sure you can totally let go? There are tools to help you. Asana, Toggl and Bitrix allow employers to set goals for each member of the team, have employees communicate about the projects they are working on, and ensure that target goals are met. Employees can view their goals or targets from a dashboard that keeps track of their progress. This also allows employers to view their employees' progress as well and notice the difference between productive and busy people. Employers will be able to determine which employees are going above and beyond the call of duty and reward them in order to keep their best employees. Employers will also be able to tell which employees (if any) might be slacking a bit. That way, they can successfully deal with underperforming employees on time. Some remote employers find ways to have their remote employees bond every week, in other ways besides meetings. For example, employers establish social media pages that are private for their employees, so they can post activities, forums and personal success stories, either about the company or within their personal lives. They can post pictures of their families, and you can ask questions to keep the conversations going. Some remote employers offer prizes for correct trivia answers. In addition, some remote companies host social get-togethers that allow their employees to meet and talk. If the employees don’t live in the same area, think about hosting events in several different locations. One remote employer holds regional meetings for their remote employees once a month in different locations, so that their employees meet each other, as well as managers, they might not have met before, so that they can gradually get to know everyone in the company. Another company that hires remote employees has a once-a-year meeting with all of their employees so that they can get to know all of the employees of the company which then allows them to make connections that can be reinforced through get-together meetings during the rest of the year. Check out more great strategies to keep your remote workers happy! While not all companies can have remote employees and make it work, some companies have figured out the strategy to make hiring remote employees worthwhile and cost-effective. Through the use of tech tools, companies can ensure that their remote employees stay on target with their goals and work, have great communication with each other, and have a little fun along the way through meeting and working with other employees who share the same work ethic and philosophy. Being a senior business associate, Peter Davidson strives to help different brands and startups to make effective business decisions and plan effective business strategies. With years of rich domain expertise, he loves to share his views on the latest technologies and applications through his well-researched content pieces. Follow him on Google+ and Twitter.